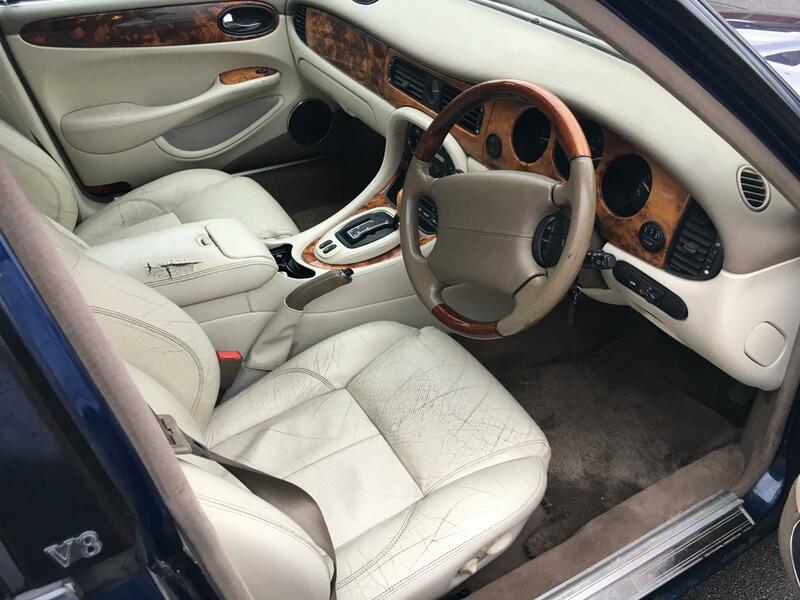 So I've been pretty much obsessed with Jaguar XJRs since trying a broken one (X306) in the spring. 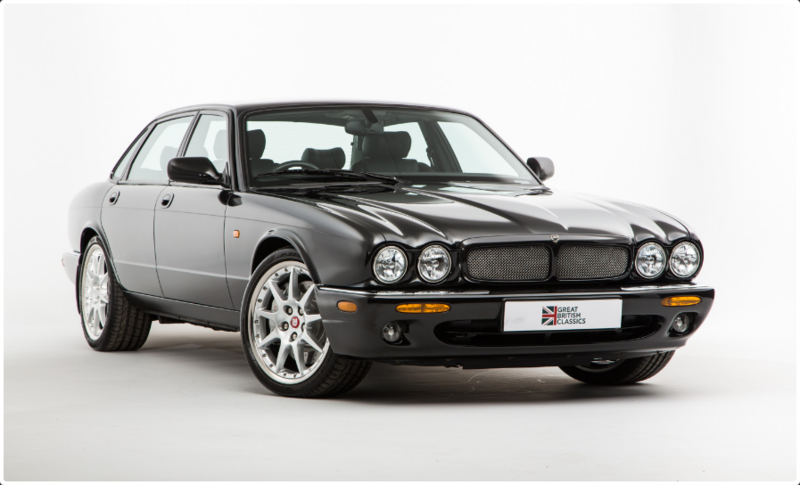 They are not very easy to buy though especially as I prefer the XJR6, which is starting to creep up in value. Anyway long story short an X308 fell into my lap just like that last week. I was close by, got there first and did a deal. Interestingly the car was not for sale in a sense, the number plate was. The car was just a freebie. The deal I did, after very nearly just walking away from it, was for the dealer to keep the plate and for me to have the "free" car fairly cheap. The dealer pushed for this since he really rather wanted to deal with me than scores of people who were trying to swap for an Xbox ONE M8. There was total understanding it's a rough car, but given the price it would be fine even in the event that it died since it could just be chopped on for spares. Anyway I left it for a week to clear some room on the fleet. 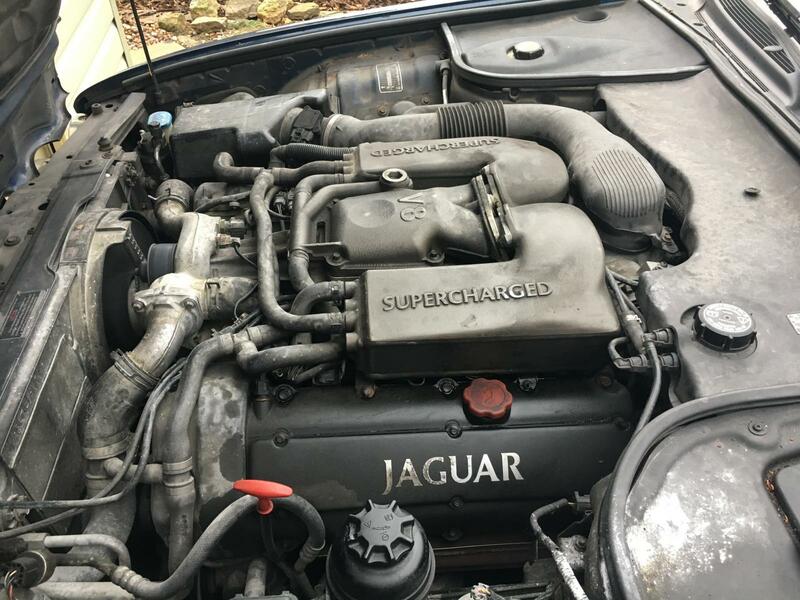 Speaking of witch "PLEASE BUY MY XJ SPORT AS SEEN IN ANOTHER THREAD!". 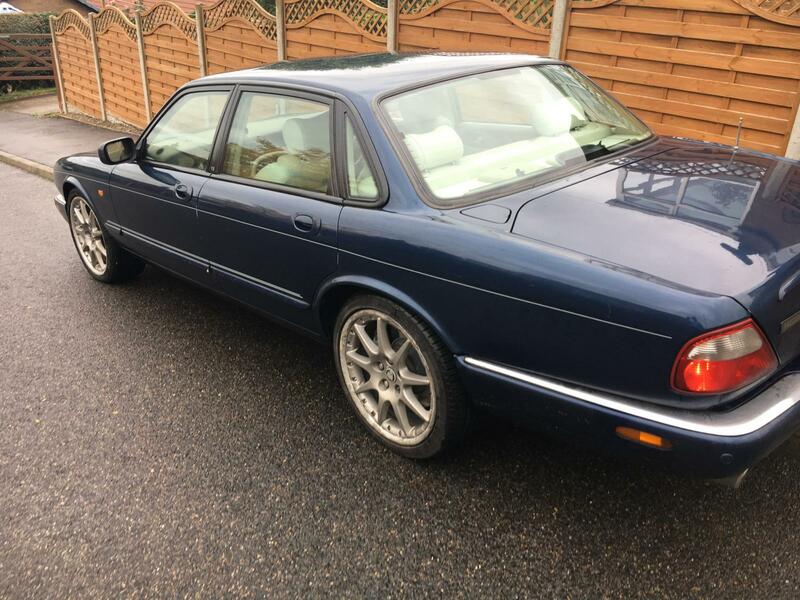 My main concern despite having already test driven the XJR was that would it make the 85 mile drive from Bury to the East Riding. Today was collection day in horrendous weather. The first problem was that the battery had died. I later realized a interior light had been left on which might have drained it. With the engine running a quick check of vital fluids said all was ok, then £35 and off home. The winds were so strong on the M62 that even a 1.8 tonne Jag was getting blown about. I took it very gingerly on the way back, which is evident in me achieving a claimed 25 Mpg. So it's on the drive now. There is belt noise from cold and the headlining has dropped completely. Those are the two main issues off the bat. Also the wheels are hideous. I bought a set of X300 "Sport" wheels. which I picked up cheap. 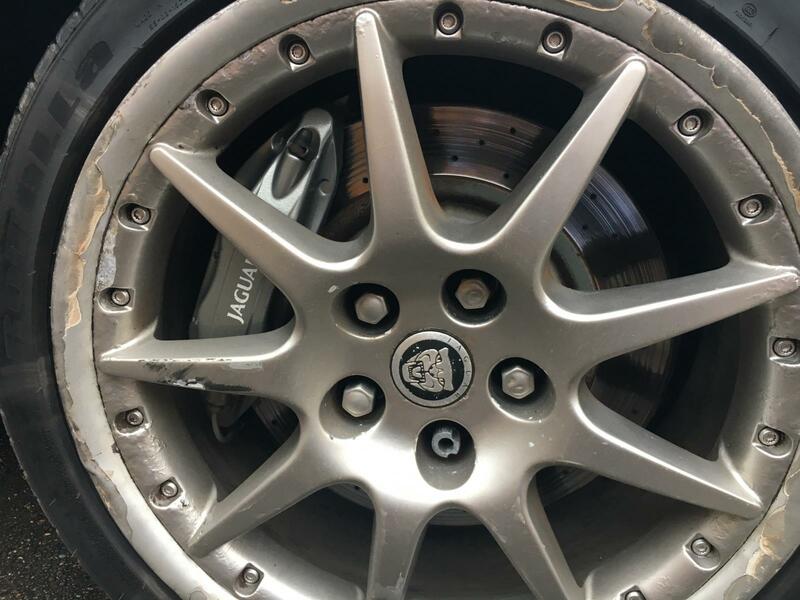 Problem is now I realize the brakes aren't standard XJR, they seem to be the optional Brembos which makes me think 17 inch wheel will not clear the caliper. As irresponsible purchases go, this is up there. Weapons grade Autoshite, hope you approve. I' really pleased with the functional air con and heated front screen as with the lambs wool rugs. They are really rather silly. Obviously the plate is coming off when the DVLA have processes the application, other than that it's running and on the road. For how long, who knows. Haven't made an attempt to use the performance yet due to the terrible conditions. I get the feeling it could go rather quickly though. I'd love to try one of these one day. Either that or an S Type R, but those tend to make a bit more. Those mats might become pivotal in reclaiming precious pennies in the event of catastrophic problems! I just took it out again for a quick blast local, now that the worst of the rain has gone. It also has check engine light which I scanned. P1646 and P0400 initially which cleared, P1000 and P1111 seem to pop up also (manufacturer specific codes I guess). P1646 came back with CEL. My underlying thought with the car was that the supercharger wanted rebuilding. There is some top end sounding noise which became aggravated with a 20-60 pull. I don't think at this point with 125 000 miles the engine itself is going to grenade, but bearings fail on the blower definitely and no-one ever changes the oil. I'm up for trying to rebuild it. The big belt will have to be changed anyway, just saw it was a bit damaged on one spot. The acceleration at full throttle is like engaging warp drive. It’s scary fast for what it is. Easily the fastest car I’ve ever driven. No more driving on boost till supercharger rebuilt though, I don’t want to tempt fate. I’ll ask Jaguar tomorrrow about getting a radio code. I’m taking bets on how much that will cost. Is that body filler on the wheels? This looks totally excellent. If I had the spare monies I would be buying your other one right now. Nahhh, Nikasil Coating, same stuff they used on the bores innit. No Nikasil after MY 2000 from what I read. 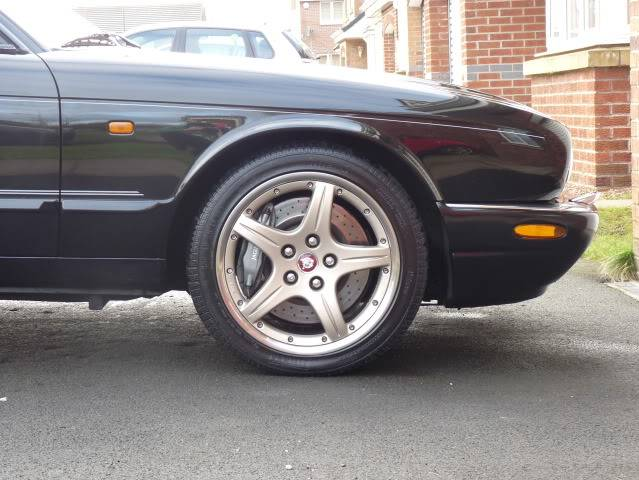 So buying the magnificent X300 XJR “Sport” wheels seems to have been a rare* lapse in judgement. They don’t clear the massive brake callipers. That’s sad. If anyone wants to buy the set, let me know. They are currently stripped of laquer and I was planning to paint them silver because some oxidation has ruined the diamond cut look. Have a full set of Conti Tech 3 tyres. Two usable, two not really. The wheels themself are not curbed at all. Tyres are 255/55/17. No Nikasil after MY 2000 from what I read. As you were Sir, if it was a DIY refurb it is P38, If it were a pruffesnal job it is Upol. Car looks great and the wheels will respond to some fettling again. Spanklyicious! These are the ultimate modern Jag for me. Much wantz for one from me as well. I think the wheels are great, they just don't particularly suit the car, and make it look a bit like a donk. Though if you need 18s to clear the calipers I guess your options are limited. Something with thicker spokes might suit it better, or a more dished wheel. I'll get on that tomorrow. There is some laquer residue I still need to get off, then the front surfaces are at least in a consistent* state. I've been using paint stripper and doing it gradually. Today I had a quick look at the supercharger. I was able to slip the S/C belt of very easily. Two 10 mm bolts hold the radiator cooling fans on the rad. Undo them, then pull up carefully avoiding snagging on anything. When the fans are most of the way out you can unplug them both and cut the cable ties holding the cables on. With the fans out you have lots of access to the S/C belt and auxiliary belt. They both have auto-tensioners. At least for the S/C belt you can fit a 1/2 inch square drive into the tensioner and lever it. I used a large 1/2 inch breaker bar which made it very easy indeed. There is talcum powder all over the shop where someone has tried to stop the belt squealing, which probably made it worse. Below is a video of me getting a feel for the S/C. There is no end float, but it doesn't feel tight at all. It feels like weights shifting. Anyone got an informed* opinion? Two videos attached. One showing me fiddling with the S/C and the other with the engine running. Now that I listen to the engine, it sounds like the exhaust is blowing also. There is a small split on one the flexi pipes by the look of it. Yes I think the wheels ruin it really. It's kind of a shame it has the massive brakes otherwise I bet the "Sport" wheels would probably go on fine. I'm pretty stuck. I can't justify spending lots and lots of money on wheels. It will have to have a full set of matching tyres given the lethal performance, so I will have to commit to a set of wheels. Worst case I guess I just stick with these and fit new tyres (maybe they would look better painted black?). It's looking more and more that this car is indeed a XJR R1, which should have come with BBS Milan wheels (they look ok). My wheels look just like those from the XJR 100. Anyway at the moment I have thrown away a load of money on the Sport wheels which I need to try and break even on. 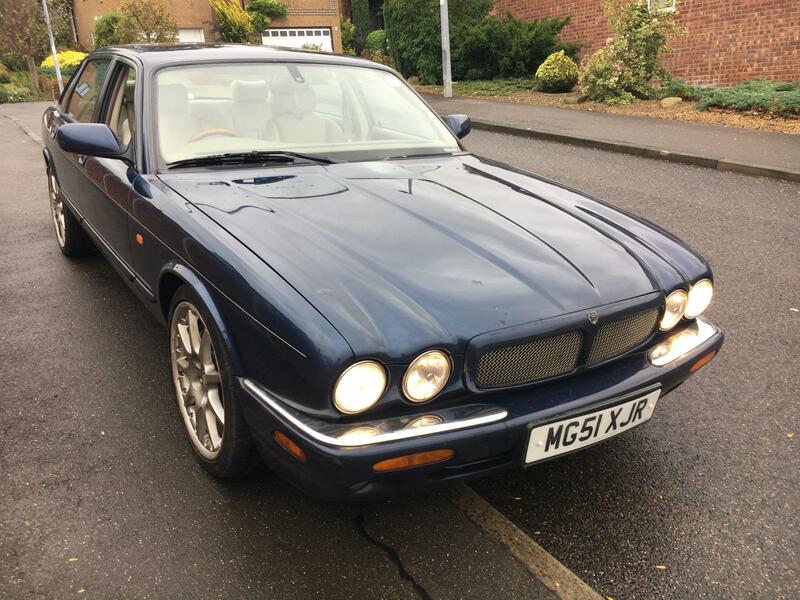 This will never be a very exemplary XJR, but it might have a fighting change at getting the engine running right. 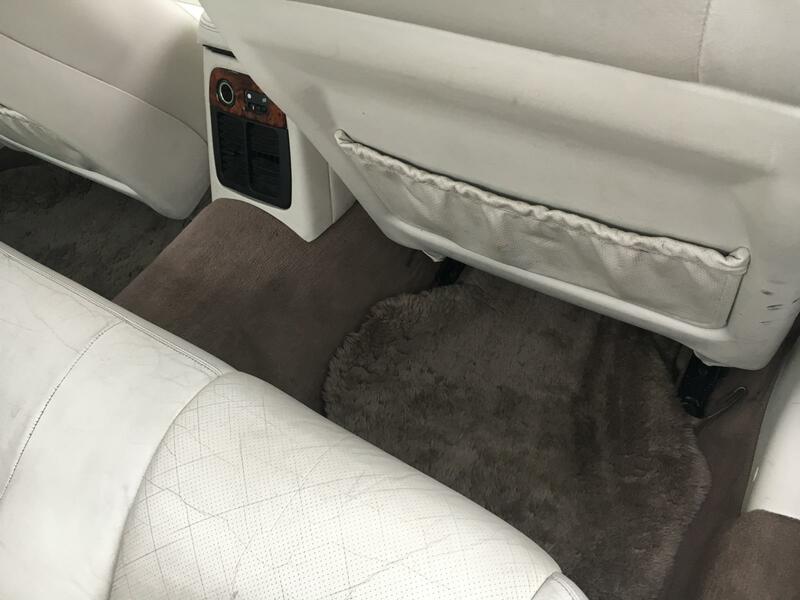 The interior will clean up definitely (just that arm rest and the sagging headlining are real eyesores). The bodywork might just scrub up to medium good. If it then went on to pass an MOT, I would be rather pleased. Gonna go against the grain and say 'I like the wheels!' They'd look good with a splash of silver paint around the rims... or stripped and polished What's an XJR R1? 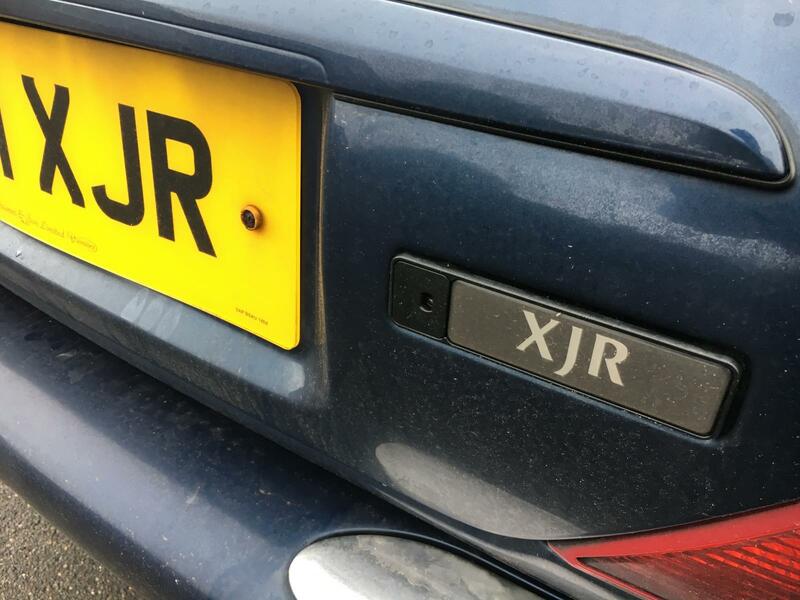 Apparently: "Available on late XJR models was an "R1" performance option. This included 18" BBS wheels, larger Brembo brakes with cross-drilled rotors, and re-tuned suspension." This is magnificent. I love it. Is there any better way to spend a grand? Certainly not any way to go faster for that money. Or look as posh. If these are the type of supercharger I think they are then they use two big spinning paddles to pump the air in. That'd be why it feels like turning weights. P1646 Googles up as a Lambda Sensor problem, but you don't need me to feel you that as I'm sure you have already checked. I do have some Lambda (Heated Oxeqyn Sensor) experience from x-Types. Before anyone rockets up and says x-type, pahhh, this is a propaer jag innit m8 my experience has always been the heater circuit failure of the sensor that then gives a resistance that the ECU doesn't like and throws the CEL / EML. I once read, and can't find it now, of a guy who had got a socket off a scrap car loom and a plug of an old Lambda sensor. He then soldered in a resistor in between the two. 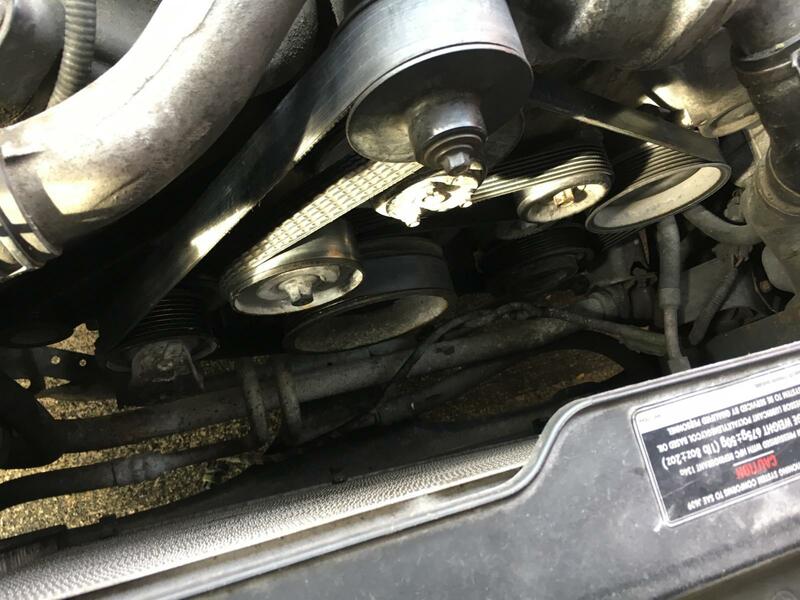 When he had a CEL problem he cleared the code and plugged in his 'fooled lead' and ran the car for the required number of 'cycles' to make sure the CEL/EML stayed out. I thought this was quite clever but couldn't find the thread with the resistor value he used. I did find this http://www.jaghelp.c...odes-p0031.html. I recall checking my sensors and finding no resistance. I flexed a resistor pack in an MGZR heater a few years asgo with a couple of ceramic resistors from Maplins at about 20p a resistor. Not because the pack was expensive, just because somebody had taken the time to post the values and I could. Repaired unit is still working perfectly some 5 year later. The supercharger on these is a simple thing with 2 big counterrotating screw things driven by a little sealed gearbox. Theres not much to go wrong, I guess either the gears or bearings could wear, leading to the rotors contacting rather than just being a very close fit. I'd suggest taking it off to have a look at the rotors, if they've not been obviously touching then change the oil. If there are no bits of metal in the oil then it's probably fine for another 10000miles. The charger is yank engineering, simple and effective. Your belt noise is more likely to be belt or tensioner, that belt looks well past its sell by date. Can't tell much from the video but there us also a tick sound up top and exhaust blow underneath that could be manifold blowing? Good luck, wish I had the time/drive space/plums to be equally daft. Top work here! I love these. 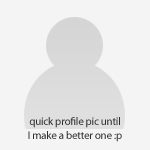 Looking forward to seeing how you get on with it. Agreed on the wheels letting it down but be patient, sort out the other bits and pieces and a set will come up. Although powdercoating would make them look a milion times better, have you thought about that? Headlining - try this trick. Masking tape it into position stretched - use as little as possible. Buy a big can of cheap unscented hair laquer. Leave the doors open and I'd recommend a mask and goggles and give the whole headling a light spray. You dont want to get it too wet...leave it half an hour. .repeat3 times. You may need a few additional pins at the edges when you removethemasking tape. Its a botch but should hold up. You may want to cover the interior with an old sheet or plastic sheet when doing this. Thanks all. If we did the annual Autoshite awards, I would definitely be hoping for fastest shed 2018! Bad weather stopping play today. I might try the headlining trick, although removing the headlining isn’t that hard. It would be relatively simple to fix it well with the headlining out. The S/C belt is just £20 so that will be ordered today. I think the order of business as suggested is to identify exhaust leaks and patch them to see what strange engine sounds remain. I wondered also whether a leaking exhaust would throw a CEL in some cases. When it runs better I will attempt a 0-60 test and post the video here.